We have been in mother of all bear markets since 2008. In this phase, we rarely had any significant price correction in excess of 30%. This is an important phase in the context of the Indian market and economy. As a country, we are undergoing a grand transition from being a developing economy to a developed economy. Barring few abrupt and intermediate phases of bear markets, the Indian market is likely to maintain its bearish bias over many years to come. In this context, it becomes very important to know how we approach the price movement in these bearish phases of the market. We all know that options are money multipliers. A 20 Rupee option can become 200 in a matter of a few hours. 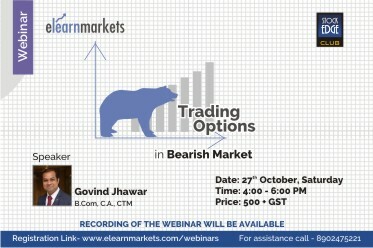 This webinar teaches you option strategies which are suitable for such bearish phases. We will also focus on Money management and risk management strategies in such option trades." When to use, How to use and why it should be used? Mr. Govind Jhawar has 14 years of experience in the Capital and Derivatives Market. He is a well-known icon in the field of Options Training Program being conducted by him since past 10 years. Till date more than 4500 students have been trained by him and his focus on developing new options strategies and trading techniques. He provides consultancy to members of exchange for Options Trading. He has done international workshops on options. He has successfully anchored 20 workshops on Options on Behalf of BSE. Good seminar and had a very good knowledge about the bearish strategies.